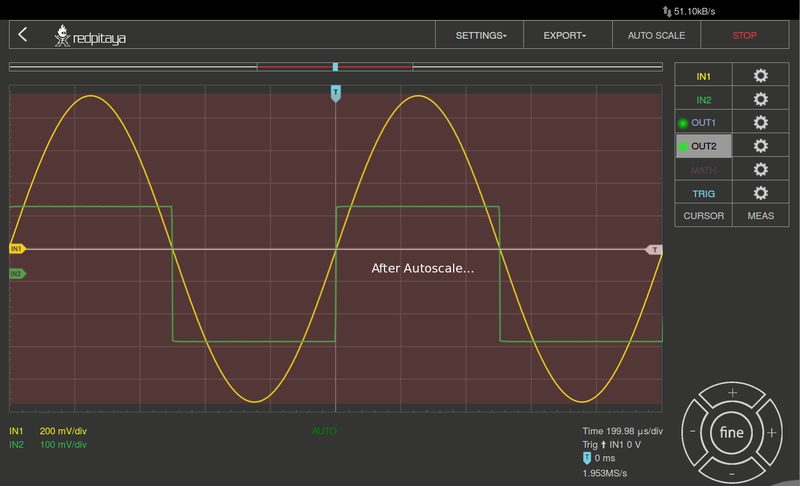 Autoscale: Automatically sets up the Oscilloscope settings for the optimal display of the input signals. By pressing the button the voltage axis and time axis are set so that at least one full period of the signal will fill the screen. 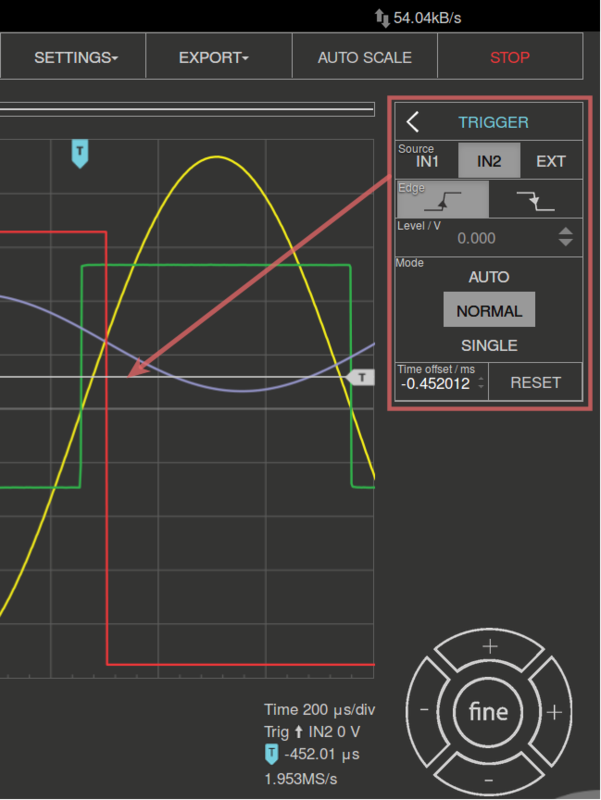 Channels / Trigger / Measuring Tools: This menu provides controls for inputs / outputs, Trigger, guides, and measurements. 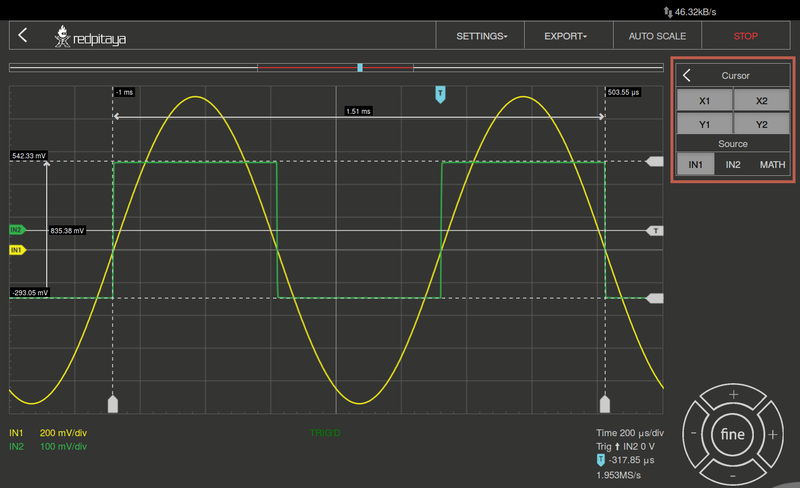 Axis control panel: By pressing the horizontal ± buttons the scaling of the X axis is changed and thus the selected time range which is displayed in the graph. 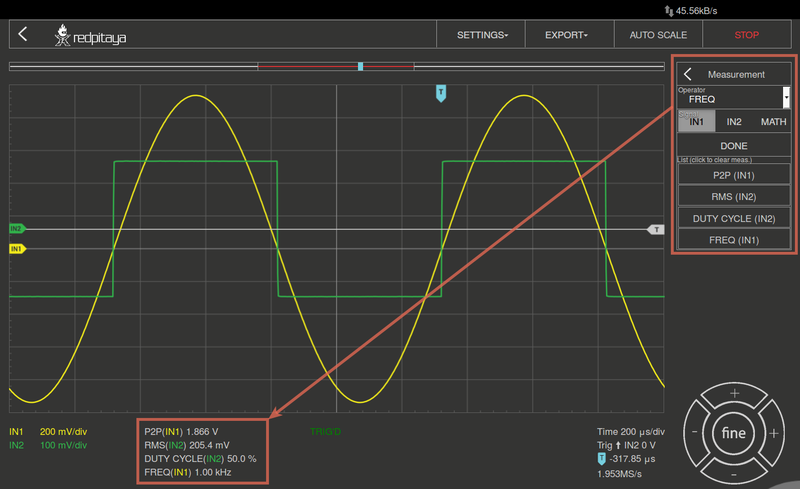 The vertical ± buttons change the Y axis, and thus the displayed voltage range of the signal. 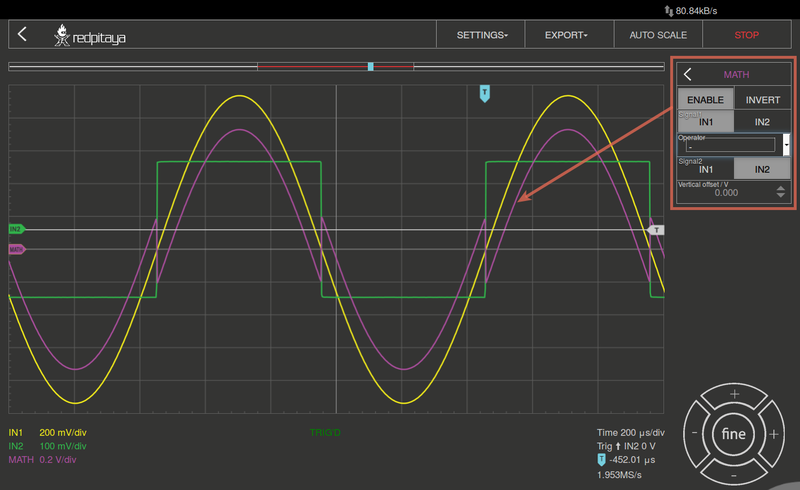 In addition, the setting for the time frame, trigger, zero point of the X axis and the sampling rate are displayed. Channel Setting display: Indicates the scale of the Y axis for all channels that are switched. 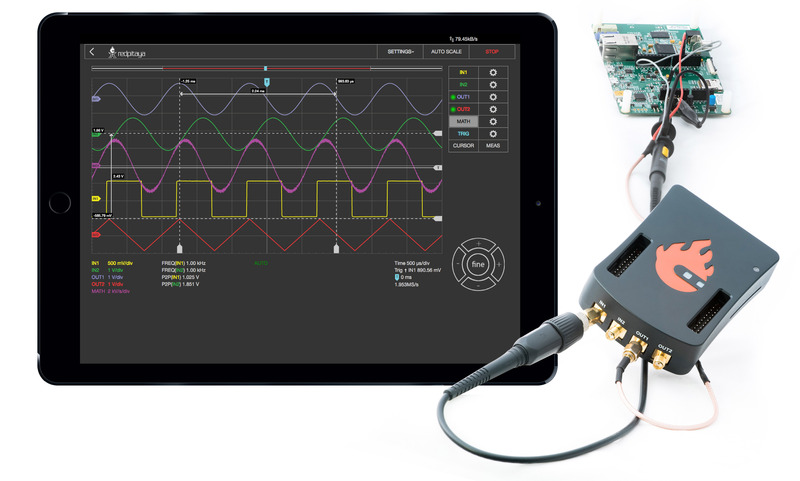 Automatically sets up the Oscilloscope to best display the input signal. By pressing this button, the voltage axis and the time axis are set so that at least one full period of the signal will fill the screen. On the right side of the Oscilloscope&Sig. Generator application interface the IN1 and IN2 channels are listed. By a simple click on the name of a channel (not the gear) the channel gets highlighted and you can simply control all the settings of the respective channel. SHOW: Shows or hides the curve associated with the channel. INVERT: Reflects the graph on the X axis. Probe attenuation: (must be selected manually) The division that was set on the probe. Vertical offset: Moves the curve up or down. LV and HV: Must be selected according to the jumper position on each channel. On the right side of the Oscilloscope&Sig. Generator application interface the OUT1 and OUT2 channels are listed. By a simple click on the name of a channel (not the gear) the channel gets highlighted and you can simply control all the settings of the respective channel. The available settings are the following: ON, SHOW, Type, Trigger, Frequency, Amplitude, Offset, Phase, and Duty cycle. Various waveforms are available for output: SINE (sinus), SQUARE (rectangle) TRIANGLE (triangle), SAWU (rising sawtooth), SAWD (falling sawtooth), DC and PWM (Pulse Width Modulation). LEVEL Trigger level value is used to determinate at which value of signal amplitude the trigger condition will be satisfied(true). 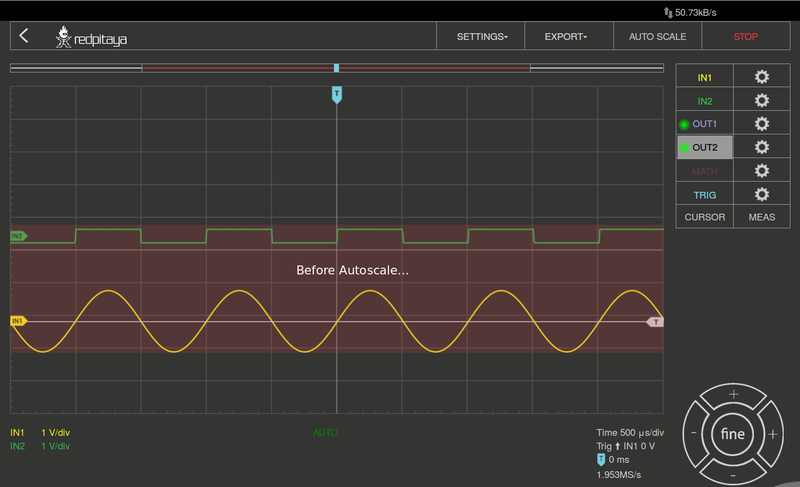 When signal amplitude achieves/cross this value the trigger state is set to “true”. Following “true” trigger condition the acquisition and signal plotting will be executed. EGDE Since during the time sweep(acquisition) signal amplitude can cross trigger level from higher value to the lowest one or vice versa. The edge setting will determinate at which case the trigger condition will be set to “true”. NORMAL The acquisition(trace (re)plotting) is executed only if the trigger state is “true”. 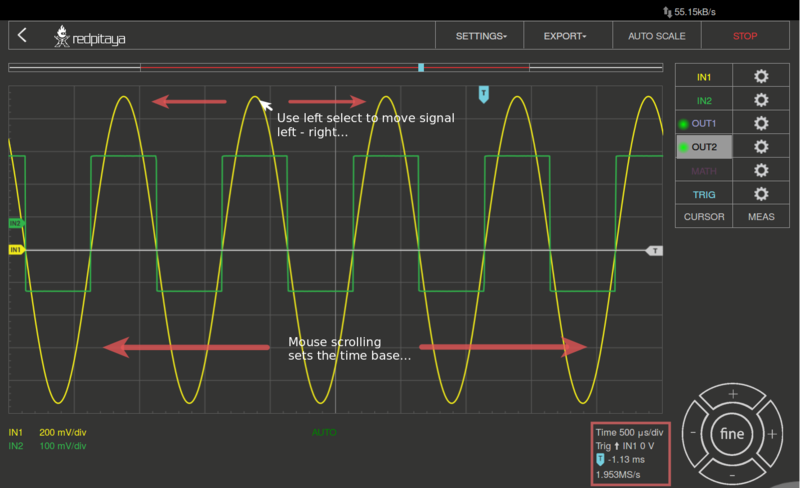 In other words; signal needs to satisfy trigger condition in order to be acquired and (re)plotted by the Oscilloscope. SINGLE After trigger conditions are satisfied by the observed signal the acquisition is executed only once and trace re-plotting is stopped regardless of the repetitive “true” trigger states. AUTO Trigger state and conditions are disregarded. Signal acquisition and signal trace re-plotting are executed in repetitive(continuous) manner. This setting is default one. The Source parameter defines the source used for this purpose. With the IN1 or the IN2 the signal at the respective input is selected; with the EXT you can invoke the trigger from outside through Pin 3 on the header row E1. + Adds the selected channels. - Subtract the selected channels. ABS Gives an absolute value of the selected signal. dy/dt Gives an time derivation of the selected signal. ydt Gives an time integration of the selected signal. 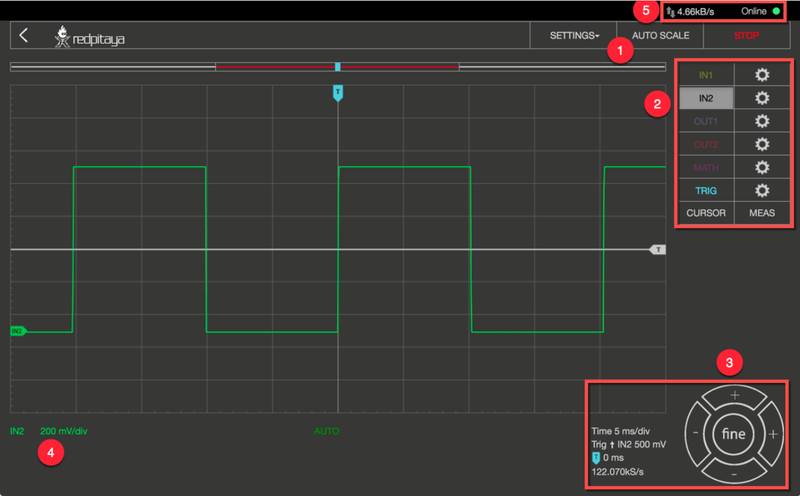 This feature enables the user to easily get the data of relevant basic measurements such is: signal period, amplitude, time delay, amplitude difference between two points, time difference between two points and etc. When you have a lot of data to analyze, it is very important to get through them easily. Navigate left and right by dragging the data where you want and effortlessly zoom in and out by using your mouse scroll wheel. P2P: The difference between the lowest and the highest measured voltage value. MEAN: The calculated average of the signal. MAX: The highest measured voltage value. MIN: The lowest measured voltage value. RMS: The calculated RMS (root mean square) of the signal. DUTY CYCLE: The Signal’s duty cycle (ratio of the pulse duration and period length). PERIOD: Displays the period length, the time length of a vibration. FREQ: The frequency of the signal.